Soon to be a thing of the past? Despite opposition from councillor Russ Wyatt and others, Winnipeg's city council voted 13-3 to proceed with the Waverley Street Underpass project. Currently, Waverley Street has a grade crossing with the busy two-track CN Rivers subdivision. The Waverley Underpass project page says about 30,000 vehicles use the crossing daily, with 35-40 daily train movements through the crossing. Personally I think that number (of train movements) is low. The intent of the project is to replace the grade crossing with an underpass (road under the tracks) and widen nearby Taylor Avenue to four lanes west of Waverley, and make some modifications to intersections to increase capacity. The total cost of the project is estimated to be $155 million, with a margin of error of -20% to +30%, meaning it could reach $200 million. The money for this project would come from all three levels of government, as well as an unspecified contribution from CN. They are requesting $45.875 million from the province and the federal government, and the city expects to pay $63 million. Dillon Consulting won the $1.012 preliminary design contract back in April 2014. This is how it looks currently. Waverley runs north-south through the centre of the map. 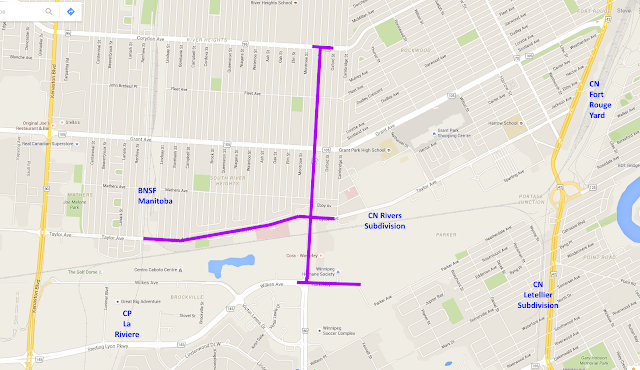 There are existing underpasses at left/west on Kenaston / highway 90 and at right/east on Pembina / highway 42. 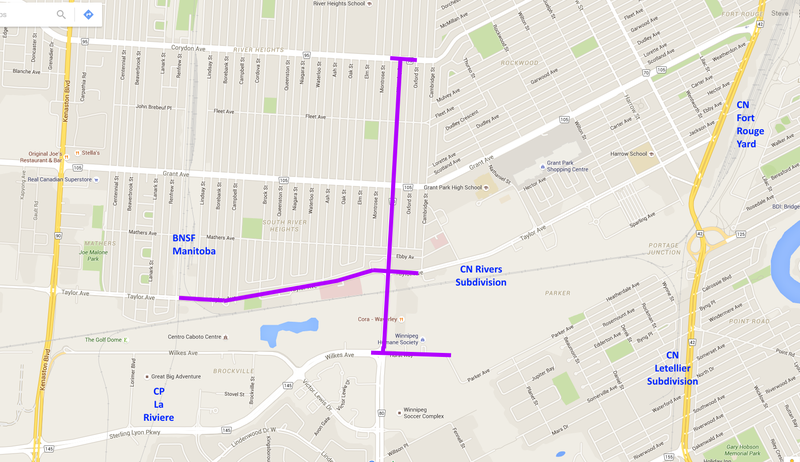 One of the controversial aspects of this project is that Waverley is not a major road north of the CN tracks. Part of the project is to widen Taylor Avenue west of Waverley to make it 4 lanes all the way, and to improve Waverley north to Grant Avenue and improve the Waverley-Grant intersection to improve capacity. Personally I am concerned about the large cost of this project and the potential for higher costs. The Plessis Road underpass project, nearing completion, has grown from the initial $77 million budget to $87.5 million so far (13.6% over budget) and is a year late. Given that a detailed design has not been completed, and this project seems to be on a rush schedule, I think the chances of the cost increasing above the forecast $155 million are high. Given that the city's revenue is just about $1 billion/year, and our city debt is about $1 billion (having doubled in the last five years), I don't see how we can take this on, as well as the stage 2 rapid transitway. We need to rein in the spending... and maybe spend it to help divert all the raw sewage we are discharging into rivers. 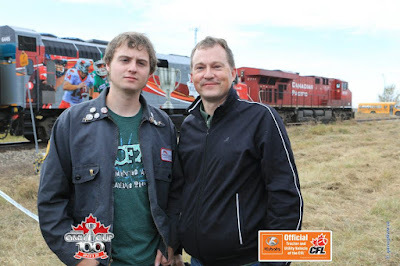 Michael Berry is a railfan based in Montreal. His photos have been published in several magazines and he is very active in social media. He's also a new father! 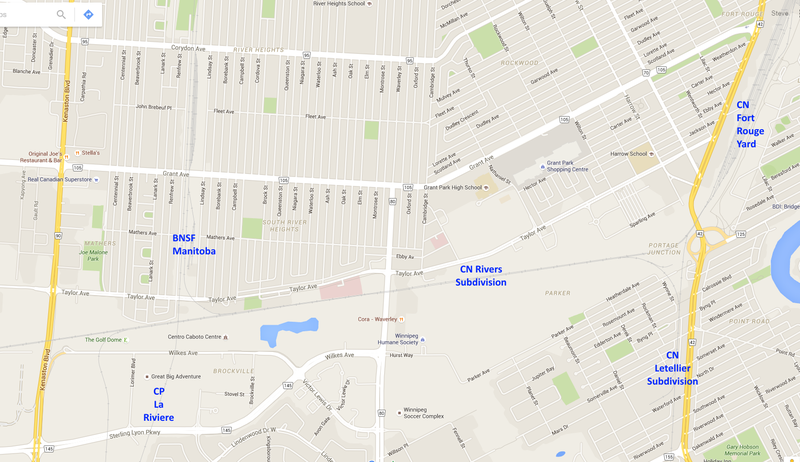 I grew up in Montreal West, which had and still has numerous CN and CP lines passing through it. 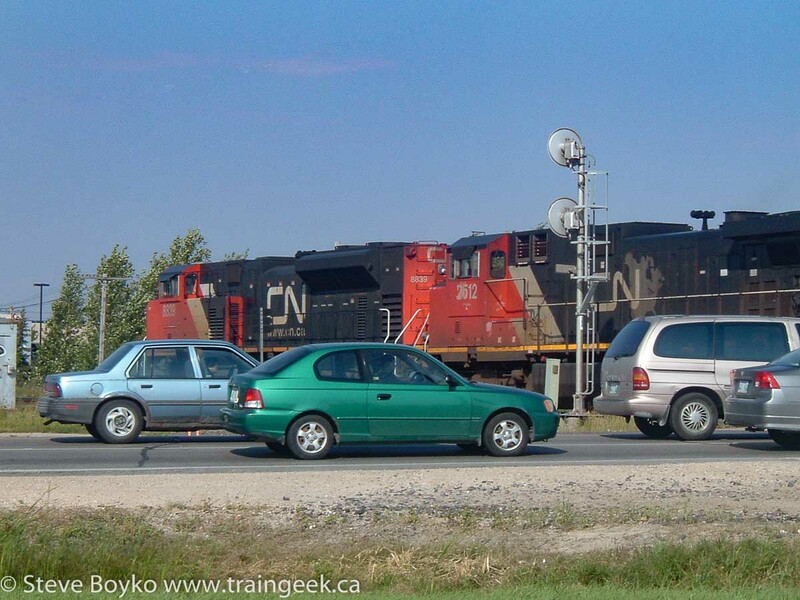 The house I grew up in was just a block north of CN’s busy Montreal subdivision and a 5 minute walk from the AMT (ex-CP) Montreal West station, so I’ve seen and heard trains all of my life. I’ve also taken AMT commuter trains off and on since I was a teenager (I currently commute to work on the AMT from Lasalle to downtown Montreal). On top of my passion for trains, I also have a huge passion for music (Rock, Soul, Blues, Country, etc.) and have a CD collection in the hundreds. I even work in the music industry, working in the licensing department of Stingray (http://www.stingray.com). I’ve been married since 2012 to a woman whose father is an ex-CP employee. Our first vacation was to Train Festival 2009, I proposed to her at Exporail and our honeymoon was at Conway Scenic Railroad, so trains are an important part of our relationship! 2. Why do you like trains? That is a good question, one I can’t completely answer! 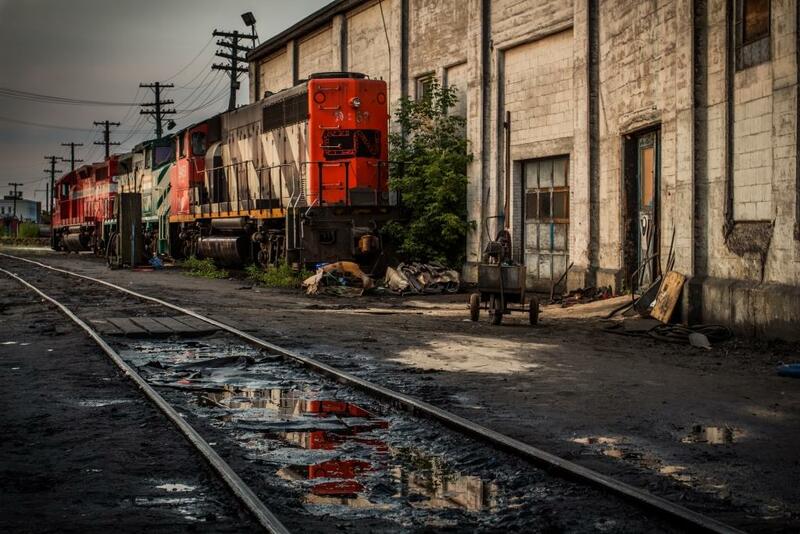 Growing up in Montreal West with trains everywhere, I have to assume it kind of rubbed off on me. I’m also a history buff, so that might be a factor as well, as railways have such a fascinating history (I have hundreds of railway books in my collection, as well as even more magazines, timetables, etc). While I have been interested in trains since I was a kid, the bug really bit me in 2005, about the same time I got my first digital camera. I’ve been taking photos on a very regular basis since then. 3. Where’s your favourite place to railfan? It’s hard for me to pick just one place. 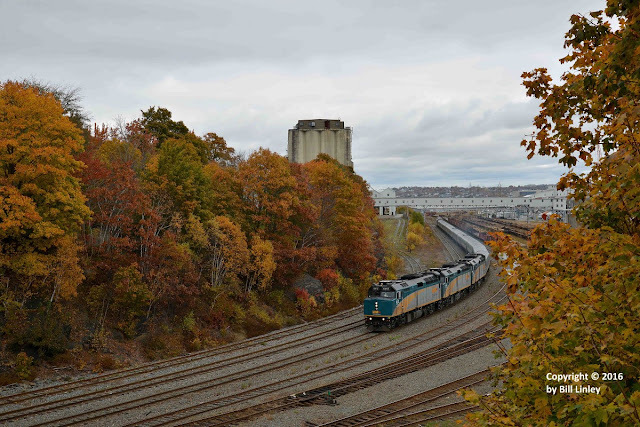 The Peel Basin near downtown Montreal is a nice location that I can go to on the way to work which allows for photos of a wide range of passenger trains with the skyline of downtown Montreal as a backdrop. The Angrignon overpass over CN’s Montreal sub near Lasalle, Qc is a great spot (albeit somewhat difficult to access) which offers a nice vantage spot for eastbounds in the morning and westbounds in the afternoon. Finally, I visit Exporail (The Canadian Railway Museum) very often, roughly once a month. I’d have to go with Montreal in the mid to late 1950’s. You had a fantastic mix of steam and diesel, as well as locomotives from CN, CP, New York Central, Boston & Maine and Delaware Hudson. A close second (and not in Canada, but close) would be the Rutland Railroad’s island-hopping line through Lake Champlain, whenever I drive through that area I can’t believe a railroad built a line there. 5. What’s your favourite railway? 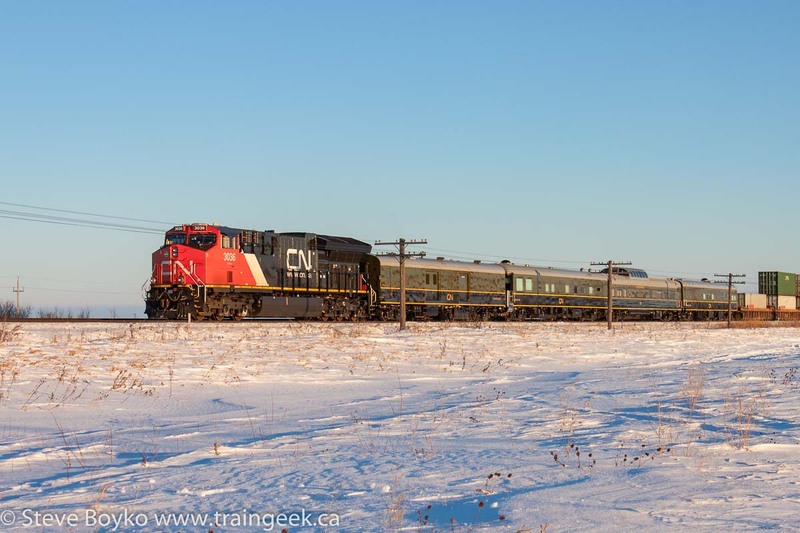 My favourite railway is CP, the history and the allure of ‘the world’s greatest transportation system’ has always meant a lot to me, and there’s hometown pride in the fact that CP was based out of Montreal for 110 years. That being said, I photograph CN trains much more often than I shoot CP trains because CN runs a lot more trains in Montreal than CP does. 6. You’re very active on Railpictures.net. What are your best tips on how to get your photos approved there? Before I answer that, I’d like to say that while getting photos approved by railpictures.net is sometimes a frustrating process (you know it! - Ed), the screening process has really helped make me a better photographer and a better editor of my photos (considering I didn’t edit them at all before!). If you want to start getting photos accepted on their site, start with the basics, i.e. a sunny, 3/4 wedge shot where the train is not cut off. Also make sure that the photo is properly exposed. You don’t necessarily need a fancy editing program. I do all my editing in Iphoto, with simple things like adding contrast, leveling, sharpening, etc. Finally, get used to your photos being rejected, probably a lot at the beginning. Don’t take this personally. Even I still get some of photos rejected. Most of the time the rejections are legitimate and fixing the photo will improve it. 7. What’s your workflow for processing and sharing your photos? Well I’m not a patient person in general, so I’m impatient to upload my photos almost as soon as I get home and then share them on a number of sites. I often have more photos edited and ready to be uploaded then I want to upload in a day, so I have various folders with photos that are edited and ready to, but not yet uploaded. 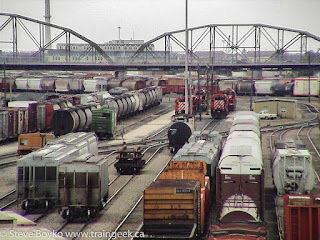 I upload to Flickr, railpictures.net, railpictures.ca and trainorders.com very often. 8. What gear do you use when railfanning? I try to keep it relatively basic, I only have one camera body (a Nikon D5100) and an all-in-one lens (a Sigma 18-250 mm) and a scanner (Uniden BC125AT). I’ll usually have the latest copy of the Canadian Trackside Guide, some extra batteries and a meal/snacks with me depending on how long I think I’ll be gone. 9. What recommendations would you give to the beginning railfan to improve their photos? Master the basics first - shoot the train with the sun at your back, don’t cut the train off if you can, make sure your shutter speed is fast enough to ‘stop’ the train. Once you have the basics, you can try more adventurous locations, angles, etc. 10. How’s life with the new addition to the family? It’s unbelievably great! My wife and I are so happy to have a healthy baby girl and we are both anxious to bring her to Exporail once the weather warms up! Ex VIA 6133 in Moncton, June 2013 - saved from the scrapper! This past week saw many of the RDCs (Rail Diesel Cars) at the former IRSI (Industrial Rail Services) facility in Moncton go on the chopping block... literally. Since IRSI went into receivership in early 2012, the province and other creditors have been working to recover whatever they can. IRSI had a large shop in the former diesel maintenance facility at Gordon Yard in Moncton, as well as a motley collection of former VIA RDCs, passenger cars, and a few diesel locomotives, as well as tools and other materials for the car repair work they were doing. At the beginning of January 2016, the word went out that the shop and land had been sold, and IRSI's collection of RDCs was to be scrapped. 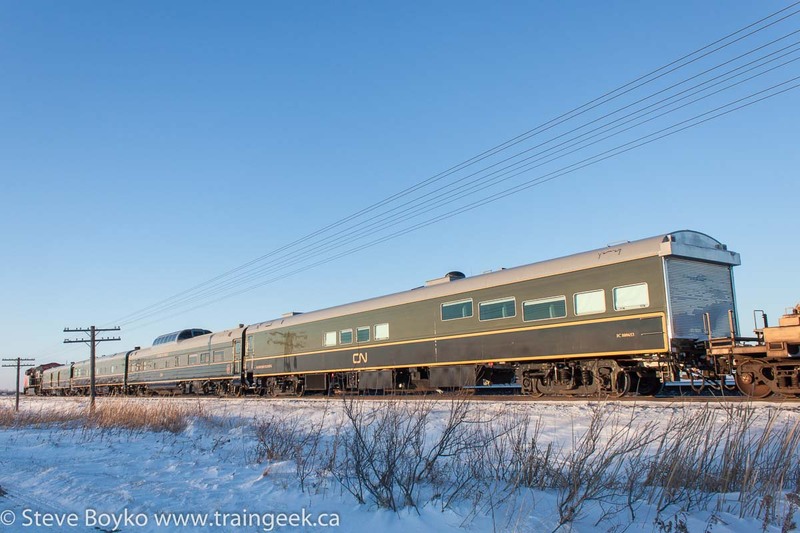 Jason Shron, president of Rapido Trains and a well-known passenger train advocate, flew out to Moncton with locomotive mechanic/restorer Chris Fox to see if any could be saved. When they arrived on January 14th, the scrapping was already underway. You can see a short video of the scrapping here (warning: not for the faint of heart railfan). Jason and Chris examined the RDCs with locals Luc Doiron and Wendell Lemon, experienced railroaders both, and after negotiations, VIA 6133 was saved from the scrapper. 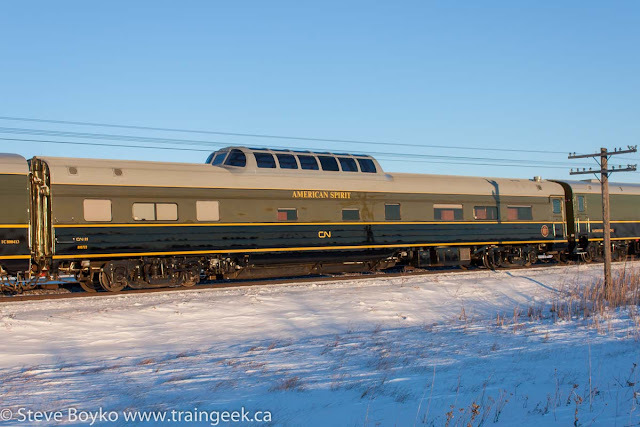 Now Rapido is asking for funding assistance to transport 6133 to Toronto and begin restoration. They estimate it will take a total of about $45,000 to move it and do an initial restoration. You can donate via PayPal by following the link at the bottom of the story of saving VIA 6133. Railfans are notorious for saying that such-and-such unit "should be saved", and that "someone" should preserve unit X. It's easy to make those statements while sitting at home. People like Jason and the all-too-few museum volunteers and supporters around the country do the actual work of preserving our railway history. I've put my money where my mouth is and made a donation. I'm also putting a link in my sidebar and I'll be doing my best to encourage others. Bill Linley is an author and photographer living in Nova Scotia. 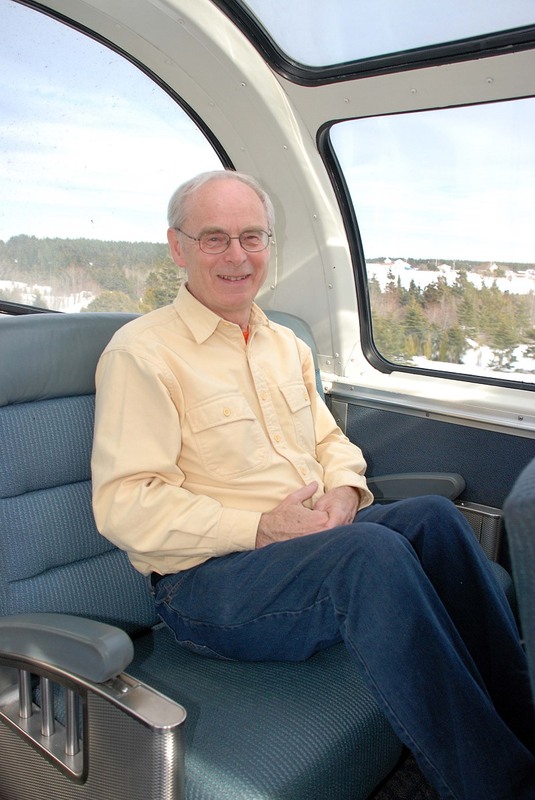 Bill has published three books through Morning Sun Books, and is well known in the Canadian railway scene. Bill was very kind and helpful to me when I was starting to railfan and he is an inspiration to my photography. 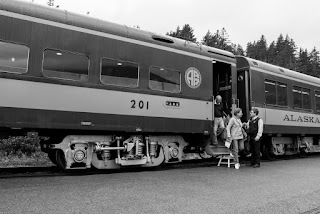 From the Bay of Fundy to the Pacific Coast, I have been photographing and writing about trains for close to sixty years. 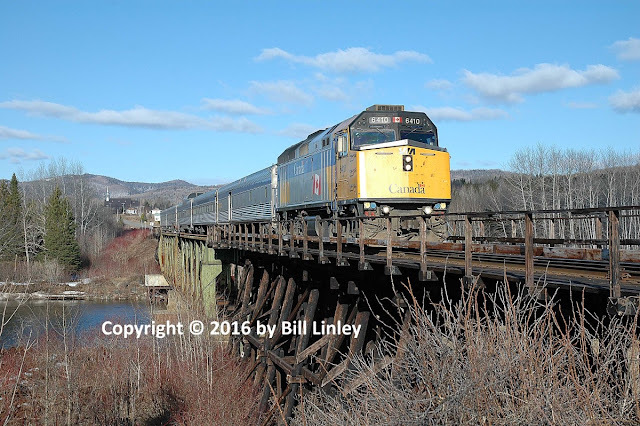 I was introduced to train watching by my father, Les Linley, in our native Toronto in the early 1950s and began photographing trains on the Quebec Central in 1959 while living in Ste. Foy, Quebec. I shot the first of some 100,000 colour slides in April 1962 with a photograph of the Canadian Pacific’s Ottawa West Station. 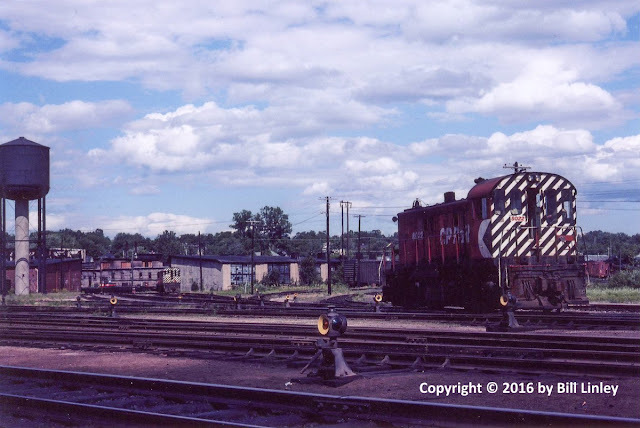 I focussed on the CPR and particularly on the changes to railways in the Ottawa region which I photographed extensively until around 1970. About 30,000 of my images are now in the CRHA archives at ExpoRail in St. Constant, Quebec. While studying geography at Carleton University, and thanks to lifetime friend Bruce Chapman, I worked as a message router at the Sparks Street office of Canadian Pacific Telegraphs. I later worked as a reservations clerk and ticket agent for the CPR at the old and new Ottawa Union Stations selling their train travel experience. Had I stayed, I would most likely be the happy holder of a life-time pass with Air Canada. 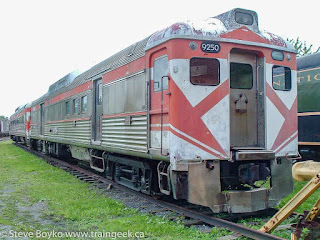 I made trips across Canada in the late 1960s trying to catch the last of the traditional railway operations in PEI, Newfoundland and British Columbia. Always a fan of MLW/Alco locomotives, I pursued these engines far and wide, notably the FPA-4s on VIA in the 1980s. Following graduation from Carleton University in May 1969, I began a 33-year career in economic development with the governments of Canada, New Brunswick and Nova Scotia. 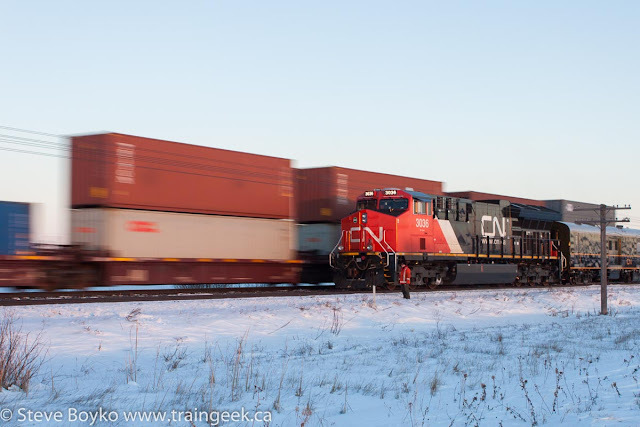 My career took me across Canada where I often managed to photograph trains in the off-hours. I moved to Fredericton and Halifax where volunteer work included a director and oft-times treasurer of church and volunteer organizations. During my years in Fredericton from 1976 through 1984, I had an opportunity to travel frequently and was able to record stations and trains in many nooks and crannies throughout New Brunswick. These formed a starting point for my 2015 Morning Sun book, Trackside in the Maritimes 1967 – 1993 with Bill Linley (my review). 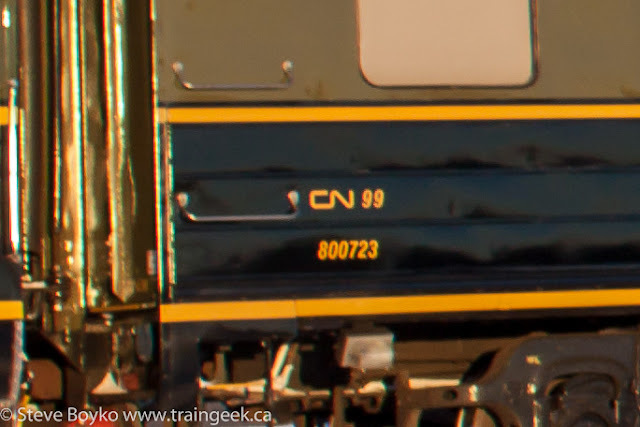 For a dozen years, I owned CN caboose 79510, a product of Point St. Charles in Montreal, and a CCF boxcar that continue to welcome guests as part of the Train Station Inn in Tatamagouche, Nova Scotia. The caboose and boxcar were re-modelled to provide first class guest accommodation for persons seeking a unique railway experience. In 2009, I was featured as a waiter in the Train Station Inn’s dining car in an episode of CBC TV’s serial The Week the Women Went. Morning Sun Books published my first two books in 2003 and 2011 featuring the Eastern and Western Lines of the Canadian Pacific Railway. They have become best sellers, and I expect that they both will be soon out of print. My Eastern Lines book was one of the first brought out by publisher Bob Yanosey in his digital reprint series. I am keen to contribute to the work of others engaged in the preservation and interpretation of railway and industrial history. I am the president of the Nova Scotia Railway Heritage Society. In 2012, I was the 25th anniversary recipient of the CRHA’s lifetime achievement award in recognition of my photography, writing and encouragement of the railway preservation movement. I currently volunteer in many community organizations in Port Lorne including the fire department, cemetery committee, wharf preservation society, the historical society, and Fundy Hall, a former Temperance Society meeting house. My wife, Marilynn, and I live in the historic Captain John G. Charlton house in Port Lorne on the Bay of Fundy near the ghosts of the Canadian National and Dominion Atlantic railways. From Sunday visits to Front Street in Toronto with my dad in the 1950s to overlook the busy railway operations to the current day, I have been impressed with the power and majesty of moving trains. Moving trains have allowed me to combine my love of geography and transportation. I am always interested in the where does it go, how did it get there, and what is around the next curve. I enjoy the adventure of passenger train travel, notably the experience of watching the nighttime countryside in winter from the snugness of a roomette in a Budd sleeper. I am currently very partial to the Young Avenue overpass in downtown Halifax. 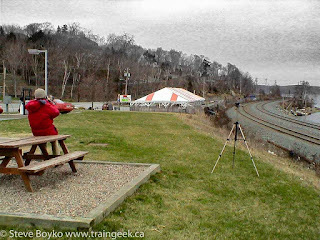 As I live almost two hours away from the nearest “hot rail” in Windsor Junction, Nova Scotia, I gravitate to the predictability of watching VIA’s departing Ocean. For me, nothing can surpass the former CN line along the southern edge of the Gaspé Peninsula in eastern Quebec. For almost the entire 202 miles of the Cascapedia and Chandler subdivisions, the line hugs the waters of the Gulf of St. Lawrence. Scenic shots are often spectacular, densely packed and ever changing. New angles are as common as one’s imagination. I first chased this line in the fall of 1969 and have been back many, many times over the last 45 years as recently as December 2015. Sadly, much of the line is embargoed and the CFBC only regularly runs over the first 69 miles to New Richmond. However, they do use some of my favourite engines, ex CPR MLW RS-18u’s! 5. What's your favourite railway? It cannot be anything except the Canadian Pacific. As an employee in the 1960s, I gained lifetime access to what I consider to be a family experience. I know the railway and we have gone our separate ways. Times have changed dramatically, but you can’t take that railway out of this boy. All else pales in comparison, as the saying goes. 6. Do you find your interest in railfanning growing, waning or staying much the same as it was? Over the years my ability to participate has ebbed and flowed but my interest has never knowingly diminished. My interests have shifted over time. I am not particularly excited by “toasters hauling boxes” as some friends call the oft-GE powered trains of today. However, I don’t hesitate to be trackside, camera at the ready, should the opportunity be there. My railfan expeditions are less of a preservation quest than they were from the ‘60s through the ‘80s. The dramatic VIA cuts in 1990 were a real turning point for me. I can be intense but I don’t always pull out all the stops. Trips are now much more about the equipment, Budd equipped Oceans, and getting together with long-term friends. I have always gravitated to the photography of Lucius Beebe and Jim Shaughnessy. While perhaps at opposite ends of the photographic spectrum, they motivate me. I am very partial to including a whole passenger train in the classic Beebe “wedgy” style, preferably showing a station or lineside nameboard. On the other hand, I revel in Jim’s documentary style, shooting the landscape often with the train as a secondary feature. Many of my friends are in one camp or the other of these styles and I try to adapt to their pace as the whole of the shared travel experience is what I now savour. 8. What has changed significantly in railfanning over the years? I think the biggest change has been the diminished access to railway personnel and facilities. In my early days, the local station was THE source of information on train operation. Divisional dispatching offices, such as Smiths Falls, ON and Edmundston, NB were open to the visiting railfan. The more remote from home, the more welcoming they seemed to be. A customary request for a lineup and an “outdated” employee timetable was rarely refused. Dispatching offices were the starting point for planning when and where to find local and symbol freights. Passenger train schedules and topographic maps, and when possible, letters from previous visitors, provided the details on when and where to shoot. Local station agents and operators provided confirmation on the whereabouts and anticipated moves of the trains in a railway rich and friendly environment. All of this provided a joy of discovery as I often thought that I was the first to be there. Today, I find that railfans are rarely welcome except at staged or sanctioned events. The welcoming informality has largely vanished in the fog of enhanced security. Today, I sometimes tune in to chat groups, YouTube or Facebook to see that everything I once pursued with the delight of exclusivity is now posted for everyone to see and share without cost. It’s much too like any spectator sport for my taste. On the flipside I learned, to my regret, that I had to replace employees with train radios. Radios are now helpful but I find it revolutionary to now have VIA’s app on my cell phone to give me streaming data as to the whereabouts of the Ocean that I am chasing. Wow! 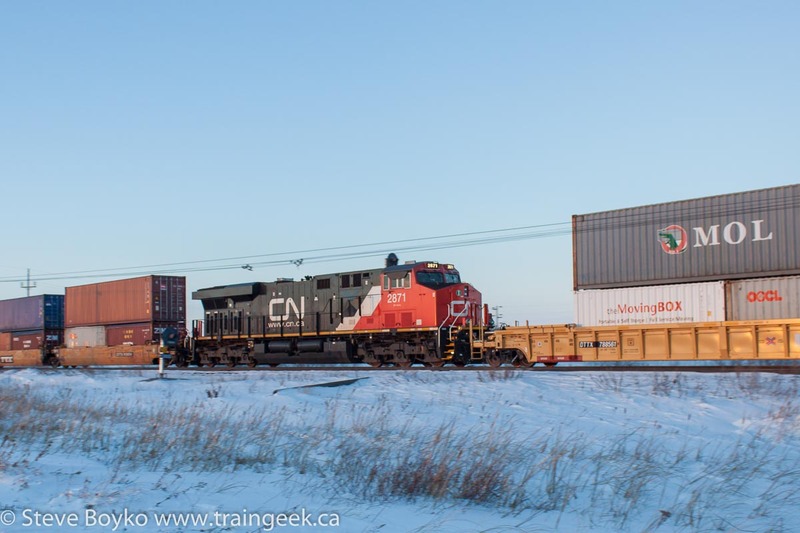 Now if we could have that for our few remaining CN freights in the Maritimes. Haven’t I heard that this is already available to fans in Ohio and probably elsewhere? 9. What's your next project? I am taking a break from book writing for a while. I do have a couple of ideas in mind and will advance them when I am ready. My current priority is to properly label the thousands of digital images that I have made since beginning the move to that format in 2002. In addition, I am burdened by tens of thousands of Kodachromes that went unlabeled for some 30 years of shooting. Oh well, I have the images and want to be sure that they are identifiable. I really enjoy the periodic internet game of “where is that photo” but do not want to leave too many behind that could lack a correct response. So scan, label, and donate now to a worthy organization. We must not let railway history fade away. 10. Film, Slides or Digital? As an old time shooter, i started out with 620 roll film yielding 8 6x9cm images per roll in black and white. I continued to shoot B-and-W until about 1970. For many years I developed my own film as a way to control quality and cost. I shot and traded the classic, medium format, 616 negatives of roster shots with people like Peter Cox, Bob Webster, Roger Boisvert, George Parks and George Melvin. We were all disappointed circa 1975 when Kodak stopped making this film. Mark Perry is currently scanning many of Peter's 616 negatives and one can readily see their quality and detail. Beginning in 1962, I started shooting in colour as often as I could afford the film. I'm so glad that I added colour as these are among my most treasured images to this day. I started with a used Agfa rangefinder camera where I had to set the aperture and shutter speed as well as the focus. I moved to a used Pentax K SLR in 1963. I had to open the lens manually after each shot to focus for the next one. Eventually the mechanism failed and I have a whole roll of over exposed images to show how it should have worked. I think that Photoshop can bring back some of the colour. I never discard a slide! At first, I shot a bit of Anscochrome and department store brands but settled on Kodachrome by early 1963. From time to time I tried new films with the Ektachrome-like E-6 emulsion that could be processed almost anywhere. I never tried to do it at home as the chemicals and tolerances were beyond my patience. Instead, I learned to make black and white enlargements which I sold on board excursion trains to offset their cost. There were several dealers on most trips with CNR 6167 and 6218 in the 60s. Around this time, I was so keen on action shots that I developed a bracket using a piece of 3" aluminum 90 degree angle stock. With two tripod screws, I was able to mount my SLR next to my 2 1/4" square format Minolta that I used for black and white. It worked very, very well for the classic wedgy shots that I favoured at the time. It was inspired by watching well-known American railfans like Bob Collins, the now-famous E-L dispatcher from New Jersey, who used a 4x5" Speed Graphic for black & white. Using wire, they formed a bracket above the Speed Graphic on which they mounted their SLR. In my rendition, I held the bracket in two hands pressing the shutters simultaneously while framing through the SLR. In 1967 my Pentax was stolen during a visit to Expo 67 in Montreal. The following March I made a visit to Henry's on Church Street in Toronto where my friend Bob McMann introduced me to "Gerry," the owner of their one and only store. They easily convinced me to buy a Nikon F for black and white and a Nikkormat FTN for colour. No motor drives, of course. They would come to me in the early 1980s. The Nikkormat was my favourite camera, ever. I bought successor models which maintained the centre-weighted metering and eventually added shutter-priority auto-exposure which I use to this day. In any event, I also purchased a 105mm lens which I found to have excellent optics, admirably suited to my growing interest in scenic, action shots. I would move to a Nikon zoom lens in the 1970s as my travel by air increased, often allowing me to have but one camera. With no regrets, I've stuck with Nikon since that first purchase from Gerry. I still have most of the cameras that I've bought over the years and enjoy handling them from time to time. In the late 1990s, I switched to Fujichrome's Sensia 100 as Kodak had consistent quality control problems which often yielded muddy, scratched Kodachromes. By 2002, our family had obtained a Canon point and shoot digital camera and I took it out West on a trip. It worked very well. So the transition to digital began. In March 2003, I purchased a Nikon D70, my first digital DSLR. It worked well and I shot with it increasingly as time went on. I now use a Nikon D600. In 2003, my base camera was a Nikon FM2 as I had avoided the top of the line models. By 2005 the film cameras had been parked and digital reigned. Part of my reasoning for the move to digital was the ease with which I could capture the date and time of each shot. Decades earlier, my lifestyle choices had excluded the continuing use of a railfan notebook. An unwise choice to be sure, but that was how it went. Also, I figured that I had enough slides to label without taking more and more. For several years, ending around 1970, I traded slides across North America so I actively took multiple roster shots, often called traders or, in Canada, spares. I really didn't break the habit of multiple shots when I stopped trading so have lots of these slides to deal with nowadays. Finally, my complete move to digital was motivated by my waning interest in extended railfan trips. In effect, I felt that I had been to most of the locations that attracted my fancy and could satisfy a lot of my remaining curiosity by dipping into the vast pool of on-line images. So much has changed from the 1960s and 70s when I was highly motivated to capture images that I believed were not being captured by other fans. It was something of a calling, a duty. Now we are instantly aware of so much that is being photographed and the documentary side of railfanning seems so thoroughly covered. I no longer feel a responsibility to do so. The lack of variety and the vanished rural railway scene has made me a big fan of retro-railfanning through chat-groups, books and magazines like Classic Trains. Railfan photography has become a recreational, even social pastime which is quite sufficient for me. Hence, I am satisfied with high quality images but do not feel the need for the permanency of film. Once again, the key thing is to enjoy and share your experiences. Thanks, Bill! You can find Bill at his web site at www.billlinley.com and find his books at Morning Sun Books. You can read my review of his most recent book. A few items of rail news all arrived at once. Two are of interest to the Winnipeg area and one to the Kamloops area, although there is a Winnipeg connection. First, a new grain terminal will be built at CentrePort in Rosser, by the Winnipeg airport just outside city limits. A privately-owned company called BroadGrain Commodities will build a large terminal to handle grain and beans. This presumably will include a modern high-throughput elevator. Based on this map (PDF), the terminal will be parallel to CP's Carberry subdivision. Second, former Quebec premier Jean Charest has been named the head of a Rail Relocation Task Force for Winnipeg / Manitoba. The role of this task force is nebulous at the moment, but they have four guiding principles, with the key focus being "enhanced railway efficiency and function in the capital region." Many have seized on this as an opportunity to move the CP rail yard out of downtown Winnipeg. The cost of doing this would be astronomical, both in terms of the actual relocation and also in terms of cleaning up the environmental damage done by the yard. I agree there are big benefits, both in terms of freeing up prime locations for redevelopment, possibly increasing the city's tax base significantly, and reducing noise and other environmental issues. I just question whether the cost is worth it, and who's going to pay for it. We shall see. I intend to watch this closely and will write about it again. EDIT: The new provincial government seems to be backing away from this project. EDIT 2: The new government definitely seems to be backing away. EDIT 3: The Palliser government has killed the study. 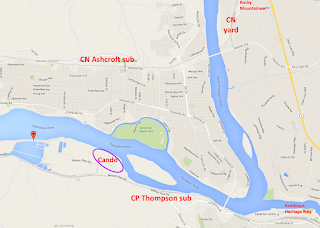 Third, Cando Rail Services has announced it will build a new rail terminal in Kamloops, BC. They acquired the former Weyerhauser sawmill site along Mission Flats Road, adjacent to the CP Thompson subdivision. Cando will build 15 miles of track there, both for railcar storage and for transloading materials between truck and railcars. They are going to start with 250 car storage spots. 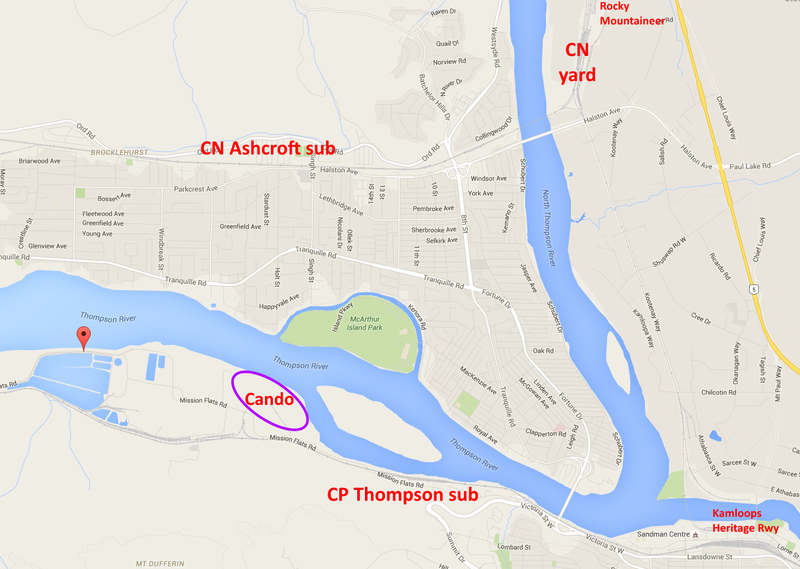 Since Cando does significant track work for CN and CP, they will likely be basing some crews and material out of there to work in BC. The sawmill was served by a wye off the CP main line. This wye still exists so it should not be difficult to get new track in service. 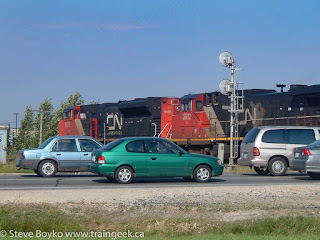 As we approached the CN Sprague subdivision south of Symington yard, I saw a long string of autoracks. 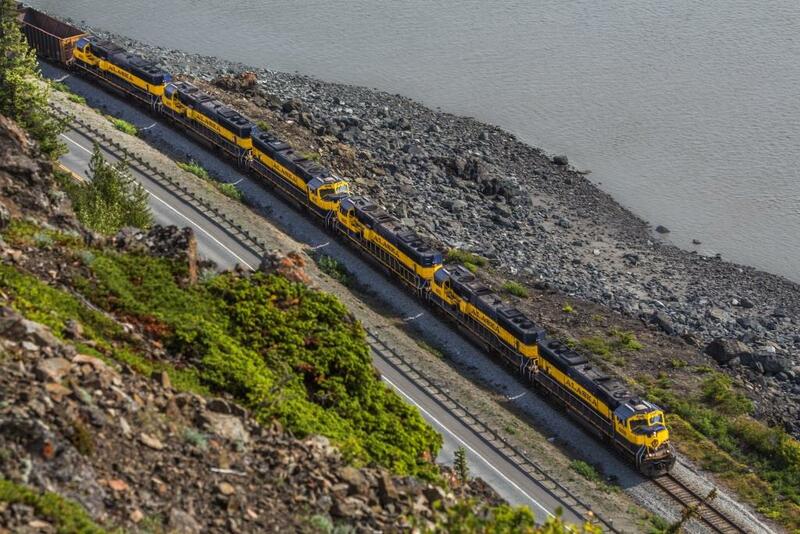 I investigated and found three SD40-2s and a slug with a long string of cars ready to shove up the hump (consist). I was thinking of driving up Plessis past the yard, but as I crossed the track by Tinker Town, I glanced south down the line and saw a very distant headlight. Train! I turned right and headed down highway #1 toward Lorette siding. 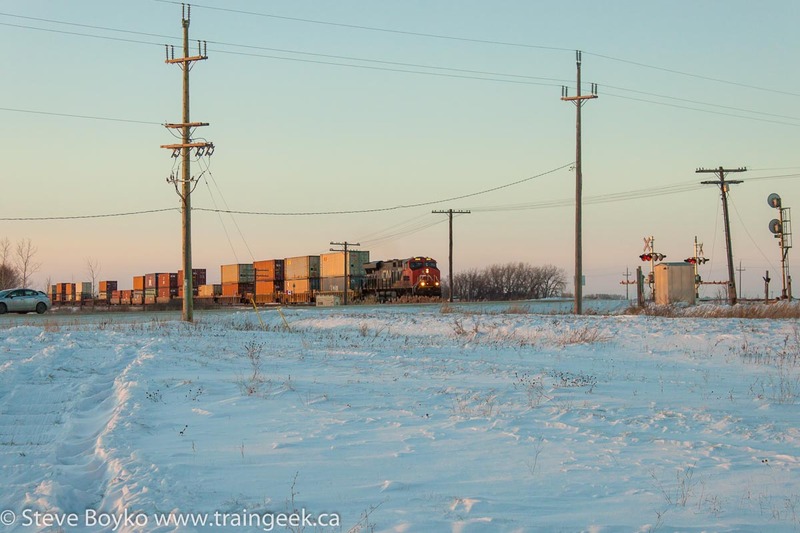 It became obvious that the train was in the siding at Lorette so I pulled up and parked on Station Road (here) at the north end of the siding. 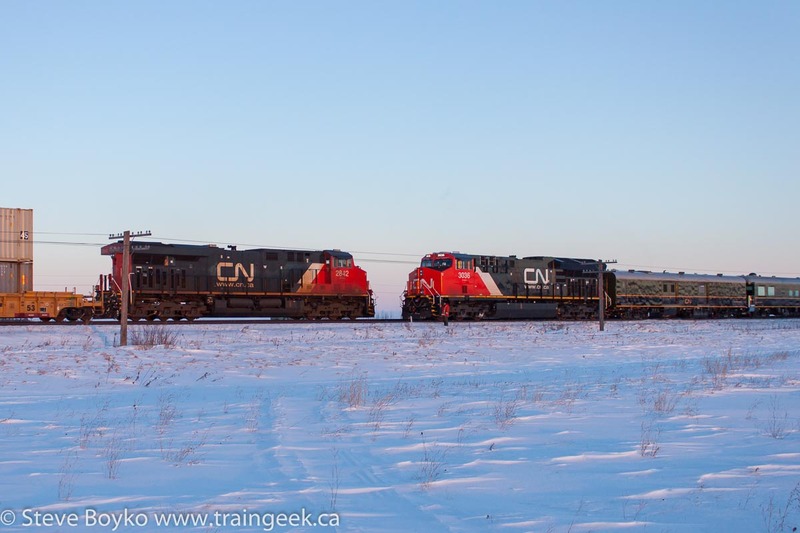 The train was CN 3036 with four business cars on the head end! A lucky find. They were just crawling up to the end of the siding when I arrived. I stepped out in the brisk (-27C) weather and walked along to photograph each car. 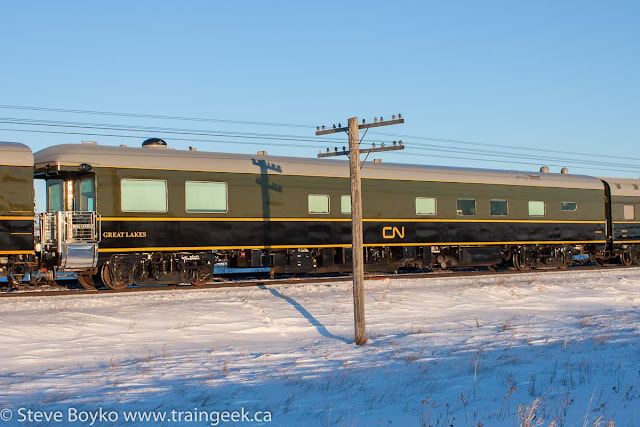 The lead car was CN 1710, FRASER SPIRIT. 1710 is a power car, and I could hear the generator running, especially since Tier 4 ET44AC locomotive CN 3036 was so quiet. 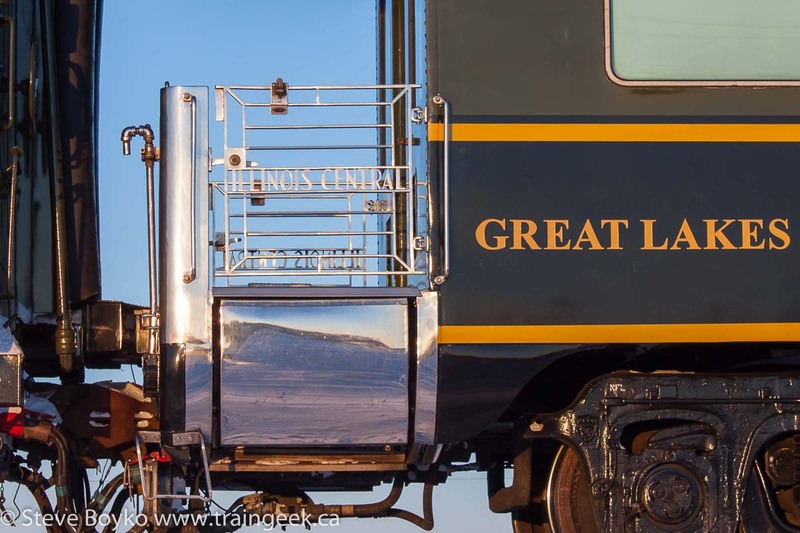 The next car was IC 800413, GREAT LAKES. Here's a closeup of the classy Illinois Central observation platform. That would be fun to stand on while the train was rolling along! The third passenger car was a dome, IC 800723 / CN 99 AMERICAN SPIRIT. I'm just not sure which number the car is! 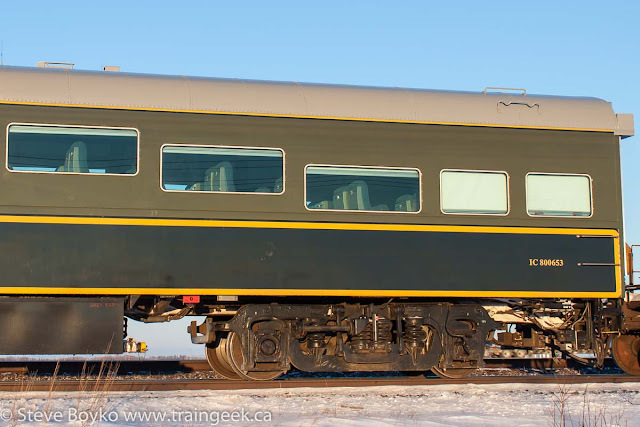 The fourth and final passenger car was IC 800653, SANDFORD FLEMING. This is a theatre car, with theatre-style seats inside and a large rear window. When I saw it the window was covered up a large roll-up door. That would be a fun place to be, too! Thankfully there was no wind. Every now and then, I walked over to the crossing to check the signal facing north. After 25 minutes, it was green over red and I saw a headlight in the distance. The meet was on! My camera was getting a little sluggish in the cold and the battery light was blinking. I had a spare in my pants pocket but I decided to stick with the battery and trust that it would last long enough for the meet. 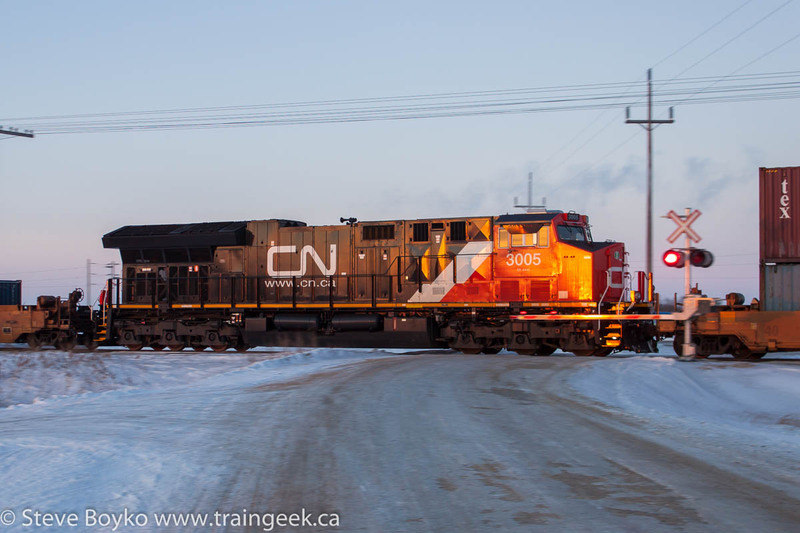 Here's CN 2842 approaching the crossing. That's my car to the left. I boosted the exposure quite a bit as the sun was very close to the horizon by this point (4:39 PM). The crew were on the ground for the inspection. The eastbound train had CN 2871 as the DPU, near the rear of the train. Once the train passed, the crew got back on 3036 and they were on their way. In the cold, 3036 was smoking like a steam engine as they accelerated away. It turned out that the train did have a DPU, shiny CN 3005. That was the end of the light and therefore the end of my railfanning. We hit the road back home and made supper. Before getting in the car, I made sure to protect my camera gear from condensation due to the change in temperature. You do not want condensation in your lens - think fungus. I had left my camera bag on the trunk to get it down to the outside temperature. Once I was done shooting, I put the camera in the cold bag and zipped it closed before putting the bag in the car. At home, I brought the bag inside and left it alone for a few hours until it came up to room temperature. It's good to remember to take the card out before putting the camera in the bag! I decided to record a video on how to use a radio scanner. I hope you find it useful. I have a Uniden Bearcat BC72XLT scanner, which is not sold new any more. The equivalent is the Uniden BC75XLT scanner (Amazon). You can shop around and get it for about Cdn $130 plus shipping (e.g. from Durham Radio in Ontario, or The Source), or $160 from Amazon with free shipping. The Uniden Bearcat BC125AT (Amazon) is a step up with alpha tagging (meaning you can enter a name for a frequency) and it can interface with your computer for setup. It doesn't cost a lot more, so I'd be tempted to get this if I were in the market for a scanner. My Amazon links are affiliate links, meaning I get a small commission if you buy something from Amazon after following the link, at no extra cost to you. Mark Zulkoskey is a railfan living in Prince Albert, Saskatchewan. We've never met but I've enjoyed and envied his photos on Saskatchewan Railways. He graciously agreed to answer my 10 questions. I’m a registered social worker living in the Central Saskatchewan city of Prince Albert, which also conveniently, was my place of birth. I always vowed to move but the prairie has oddly grown on me. I work as a Cognitive Disability Consultant for two health regions which has the added bonus of a lot of travel. I married the lady who has tolerated my obsession with trains for the last five years this summer. Of course we married at the Wetaskiwin Railway Museum and believe or not it was her idea and not mine! The running joke that day was that I preferred to ride with the engineer in the RS23 rather than with my bride. I have a 6 year old step son who I have worked to indoctrinate into the world of rail. My father used me as his launch pad into trains and I guess I followed suit. Much of my early childhood consisted of chasing CN GMD1s and CPR RS23s out to the local pulp mill or off onto the 60lb branchlines that surrounded my hometown. I started shooting trains with a bright blue Fisher Price camera that took 110 film. 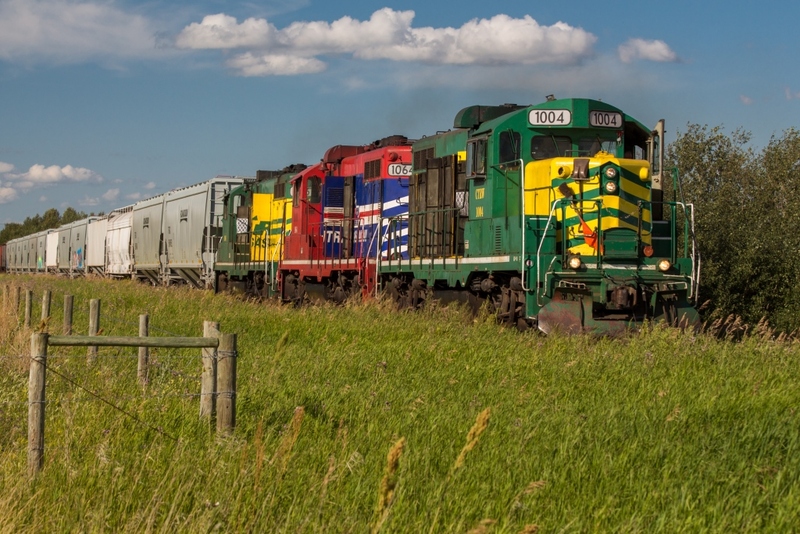 Summer day trips to all corners of Saskatchewan cemented my love in the prairie hinterland, rail and grain elevators. My father often said he would use me, with my little train hat plopped onto my head, to gain access to rail yards and to get the occasional ride. My first ride was on a pair of GMD1s and one of my fondest moments of my childhood. I was bullied in grade 6 and some of that came out of my interest in trains. I stopped railfanning almost overnight, but the call of the haunting whistle late at midnight called me back. When I turned twenty I returned to my early love, perhaps for the nostalgia but also inadvertently because my new found appreciation of our vanishing grain elevators coincided with railroad branchlines. It has all been downhill since then. 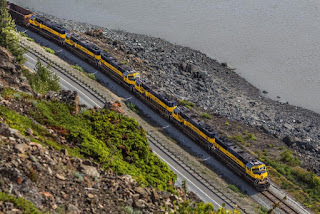 This past summer I had the opportunity to railfan Alaska Rail on my honeymoon. The rail carved through the mountains, presenting spectacular photographic opportunities. And yet at the end of the day I still find myself traipsing through farmer’s fields, flying down dusty back roads and returning to the same small town motels of Saskatchewan. The prairies are a photographic challenge. Bald prairie challenges the photographic eye and forces me to reevaluate my shots. The rail network of Saskatchewan also continues to be rather extensive. The vast array of shortlines helps keep some diversity in my shots and it isn’t uncommon to photograph four or five railways in one day. A few places of notable mention are the hills east of Biggar, the badlands near Eastend, the CNR bridge in Prince Albert and the CPR line to Nipawin. Carlton Trail GP10s, summer 2015. Note 1004 & 1064 have since been retired. Definitely sometime in the 1960s or 1970s anywhere in North America. For me this was the golden age of rail and the pathetic demise of Alco. Canadian rail would still be slugging along with CLC locos and MLW would still be churning out smoke spewing locos. I’d love to shoot Southern Ontario or my mother’s home town in Northern Ontario on the ONR. Plus the convenience of passenger travel wouldn’t hinder my ability to reach many communities across the country. 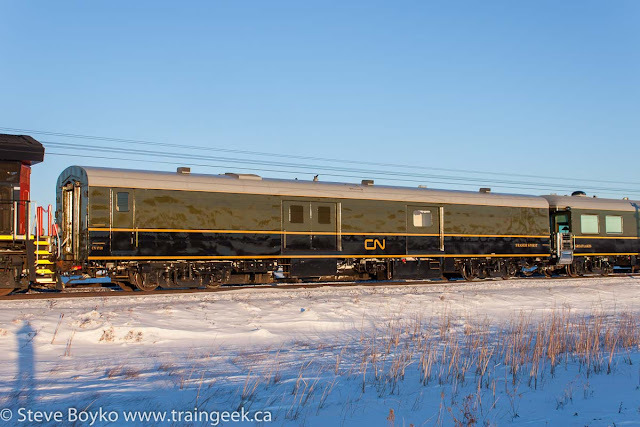 CN has been the stalwart railway of choice recently given their frequency and array of motive power; but I don’t think I’d classify them as a favorite. Great Western’s colourful power, M420s and the rolling hills of the south would probably throw them into the ring of favorite railways. Rather than quantifying a favorite list, I’d probably opt to shoot the shortlines that dot the prairies. 6. What do you use to edit your photos? Typically Lightroom 4 or Photomatix Pro 5 if I’m shooting in HDR. I used to manipulate with Photoshop for fun occasionally but I haven’t had the time for that in a few years. I’ve gradually upgraded my gear over the last few years and I really started focusing on post production when I started shooting RAW in 2013. 7. What do you aspire to be shooting in five years? I really want to focus on capturing the prairie spirit in my pictures over the next few years. I want to capture that elusive dream in my shots, the dream that so many immigrants had as they settled on the prairies (think Hearts Hill or Bents, SK). 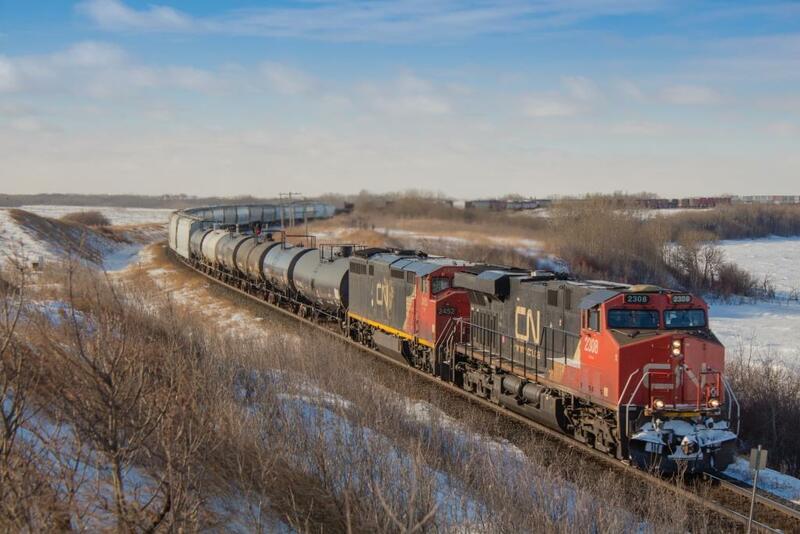 The prairie spirit is alive and well in so many communities today, through the local co-op branches to the cooperative programs that have kept the rail lines busy with producer cars. That’s what I want to be shooting. Of course I want to continue to travel and while my family will be growing in the next few years, I hope to make it out to the Maritimes, Quebec and the Rockies. 8. Where do you share your photos? Typically on Facebook book through my Saskatchewan Railways page or on RailsMBSK. 9. What projects do you have on the go? My father and I are in the process of building a switching layout for future hobby shows. The rest of my stuff is gathering dust until I can move into a larger home. I’m currently working on painting and decaling my HBR GP40-2(W). I’m buying a new camera in the spring, so I’m looking forward for a few photo runs this summer in Saskatchewan and Alberta and perhaps Manitoba. My long term photography project is to photograph every remaining grain elevator in Saskatchewan. This began in 2009 on a road trip to North Battleford. I was stopped in Leask and noticed the two lonely elevators. I remembered long trips to Alberta as a child, watching the rows of colourful elevators pass me by and how so many have now turned to dust. I started with a point and shoot and the magic of Google Maps and slowly made progress. Of course my perfectionism has caused me to do more than the one re-shoot. As of Jan 1, 2016 I have photographed 482 Sask elevators in 364 communities across the vapid prairie. I now only have 12 elevators left on my list to photograph! To see more of Mark's work, visit the Saskatchewan Railways Facebook community.